The volunteer citizen army that fought the Civil War for the North was one of the most remarkable military assemblages in history. It represented every facet of the democratic society from which it came–the raw, brute strength of that society, its youthful self-confidence, its transparent idealism, and its gawkish materialism. It was composed of men who rushed forward in the first fine flush of patriotism, and its rolls exhibited an astonishing range of personal abilities and professional skills. Lincoln’s analysis was more prophetic of the Twenty-Third Ohio Volunteer Infantry Regiment than he could possibly have known. This outfit contained among its commanding and ranking officers more names that would become famous than any other regiment in the Northern armies. Its first commander, William S. Rosecrans, ‘Old Rosy,’ was a West Pointer and Regular Army man who had resigned his commission and was in the oil refining business in Cincinnati when the war began. Rosecrans had but a short tenure with the regiment. In June 1861, before it took the field, he departed to assume a larger command post, but shortly as an army commander in West Virginia he would see it marching again under his orders. Rosecrans eventually rose to command one of the largest Northern field armies and seemed about to emerge as one of the great generals of the war–before his star sank in controversy and in the red afterglow of Chickamauga. His postwar career was distinguished. He held the offices of minister to Mexico, congressman from California, and Register of the Treasury. Eliakim P. Scammon succeeded Rosecrans. He was a West Point graduate and a mathematics professor who would prove to be too fussily insistent on military protocol to be popular with a volunteer regiment. Still, he emerged from the war a brigadier general, and afterwards represented the United States as consul at Prince Edward Island. The third commander of the Twenty-Third was Rutherford B. Hayes, who after the war served his nation as congressman, Governor of Ohio, and President. James M. Comly followed Hayes; in the postwar era he played an active role in politics and became the American minister to Hawaii. Even in the lowest ranks the regiment had a name destined for fame. A frail youth of 18 enlisted in 1861 as a private in the Twenty-Third. He rose to the grade of major, and his name was William McKinley. He would enable the regiment to go Lincoln’s prognostication one better. The Twenty-Third contained not one future President but two. But if the Twenty-Third was atypical in the men it produced, its war experience was typical, not just of other Civil War regiments, but of most outfits in most wars. For these Ohio boys spent the war doing the same dull things day after day. Their main war experience was monotony. Later they would remember only the glorious and exciting days but, like the men in the South Pacific in World War II, during the war they were, for the most part, just plain bored. The Twenty-Third Ohio did participate in the Antietam Campaign and in 1864 it followed Phil Sheridan in the Shenandoah Valley, but its fate was to spend the rest of the war in the mountains of West Virginia. Its war was a mean, hard thing, involving some of the roughest if not the most spectacular fighting of the war. it was the lot of the Twenty-Third to spend the bulk of its service in what was essentially a pocket of the war or a side show to the main event. West Virginia, as a Union-sympathizing area in the Confederacy, had a real political and propaganda value in the Northern scheme of grand strategy and, lying on the flank of Virginia proper, it posed a potential if not always an actual military threat to vital railroad lines of communication united the eastern and western parts of the Confederacy. By any measure, it was important for the North to occupy and hold West Virginia, and the Twenty-Third was one of the units that did the job. The work was necessary to the ultimate triumph of the Union cause, but it was small and nasty work–fighting in pygmy battles, chasing guerrillas, patrolling lonely mountain roads, repressing civilian sympathizers of the South. It was routine, unexciting war, and it offered few opportunities for anyone to make a reputation. Units such as the Twenty-Third experienced the worst side of war, the very hardest to endure, the kind that required duty, dirt, and devotion. In the end, the most remarkable thing about the Twenty-Third was not that two Presidents and a collection of lesser figures served with it but that it came through the oppressing obscurity of its war years a proud regiment with high morale. Organized in June 1861, the Twenty-Third contained 950 men when it went to Camp Chase, near Columbus, for its training. The Governor of Ohio appointed its officers, which was unusual–most regiments elected their leaders, up to and including the colonels–and which led to some problems. Colonel Eliakim P. Scammon, who succeeded Rosecrans at the head of the regiment, was a martinet who never could understand the ways of the civilian soldier. For their part, the volunteers disliked Scammon and other West Pointers like him, and sometimes refused to follow him. In these crises it was usually the politician turned officer, like Hayes, who had to step forward and save the situation. At the start of the war Ohio was practically without weapons to arm its troops, and with the same frenzy that marked all preparations it bought, begged, and distributed whatever small arms it could locate. The Twenty-Third received an issue of old flintlock muskets converted into ‘percussion locks.’ This was too much for the young heroes. They had come forth to save the Nation, and they expected to be given proper weapons to do the job. They refused to receive the guns. Some companies stuck the muskets in the ground by the bayonet and marched back to quarters; others simply stacked them in piles. Scammon, who had not thought it necessary to explain to the men why such guns had to be issued, flew into a rage and ordered some of the company commanders arrested. His conduct only increased the tension, because these officers could not be fairly blamed for failing to control t the situation. In some way the men themselves had to be reached and persuaded to accept the muskets, and this result could not be achieved by a ramrod colonel or by such junior leaders as captains. it could be done only by officers of some rank who were from civilian life and could speak the language of the men; who could, in the bluntest terms, place on the appeal on the level of a stump speech. Hayes, the major of the regiment, recognized his role and accepted it. he went from company to company, pleading with the men to take the guns. The weapons were the only ones available to the state, he said. They would do for temporary use, to practice the manual of arms; later better models would be provided. Besides, he went on, the man was more important than the weapon. The ancestors of the men listening to him had won the jewel of American freedom in the Revolution with muskets even poorer than these. Would their descendants then refuse any weapons in an hour of greater peril? It was exactly the kind of exhortation calculated to move the impressionable boys, and they responded as Hayes must have known they would. Somebody yelled: ‘Bully for Hayes. . . let’s get our guns,’ and the crisis was passed. Following their training, the men of the Twenty-Third moved south, to Weston in western Virginia. Their function there was to protect the Baltimore & Ohio Railroad, secure the surrounding area, and protect the Kanawha Valley from Confederate moves. Mainly they marched back and forth on mountain roads, trying to round up guerrillas. The Federals came to hate them passionately and to hunt them without pity. Even as gentle and moderate a man as Hayes could hear of their being killed without a flicker of regret. Eventually many officers sent out to catch bushwhackers would come in without any prisoners. They would merely report that they had arrested so-and-so but that in bringing him in he slipped off a log while crossing a stream and broken his neck or that he had been killed by an accidental discharge of one of the men’s guns. The men of the Twenty-Third soon developed feelings of contempt and distaste for all West Virginians, loyal and disloyal alike. In part, this was an inevitable reaction of an occupying and homesick soldiery, spending most of its time on small, lonely patrols in an alien land; in part it was a revulsion against that which was different. The natives were undeniably different. Poor, uneducated, deprived of contacts with the larger world beyond the ranges, they were unlike anything in the prosperous farm lands of Ohio. ‘These western Virginians eat and sleep like pigs,’ reported one soldier. Even when the inhabitants tried to perform acts of kindness for their military visitors, they aroused irritation by their blundering procedure. One soldier who was wounded in a brush with the enemy sought refuge in a cabin. The woman there willingly took him in and cared for him. A portion of his skull had been shot away, and the wound became infected with vermin. ON it she poured liberal does of the only remedy she could think of –turpentine! When his comrades found him, most of his mental faculties were gone. The war in West Virginia might seem trifling, but it had its unusual and even comic aspects. Indeed, at times it became weirdly unreal, as if the environment itself, the hazy, misty, and enchanted land, was creating a grotesque parody of the military art. People did strange things. A regiment moving toward Philippi heard artillery firing in the distance, and its officers concluded a battle was in progress. Assured that such was the case by a cavalryman who chanced by, the men emptied their knapsacks and began a forced march. Hundreds fell out by the road as heat and fatigue took their toll, but the remnant pushed on to the front. Panting into Philippi, they discovered that the firing was a salute in honor of the Fourth of July. In the spring of 1862 the Twenty-Third Ohio emerged from its winter camps to take up once again the task of hunting guerrillas. On April 29 Hayes, who was in command, heard that a notorious gang of bushwhackers was supposed to be operating in the vicinity of Camp Creek, about 16 miles away. Hayes ordered Lieutenant J.L. Botsford of Company C to go after them. Botsford’s men scouted the area but found nothing. Unknown to them, the guerrilla leader was observing them all the while and had reported their presence to the Confederate commander at Princeton, Colonel Walter H. Jenifer. Jenifer decided to snap up the little Federal column and, collecting his available force, about 300 troops, marched toward Camp Creek. Botsford, in the meantime, had taken up quarters in a farmhouse at a place called Clark’s Hollow. At daybreak on the morning of May 1, as the company was forming in the yard, shots rang out, and Confederate troops appeared on all sides. Hastily Company C retired into the house and prepared for a desperate defense. On the same morning Hayes had the regiment up and ready to march at six o’clock. From the first he had meant to follow his advance company, perhaps to support it, more probably in the hope of finding action. Now his desire to fight would be gratified. The firing at Clark’s Hollow was loudly audible, and Hayes gave orders to march to the sound. Rain was falling, and the going on the muddy roads was rough. But the men, just as eager as their colonel, plunged forward. When they broke into the clearing around the farmhouse, the now outnumbered Confederates broke and fled toward Princeton. Toward nightfall the pursuers burst over the mountain in front of Princeton and saw great clouds of smoke rising to the sky. Jenifer, rattled by the turn of events, had ordered the town fired and had continued his retreat. When Hayes’s men entered the town, they tried to stop the flames but could save only a few buildings. A stream of civilian refugees took the road south after the confederates. For the Twenty-Third Ohio it was a big day. It may have been a skirmish so small that regiments in the Army of the Potomac would not even have deigned to record it, but to the men of the Twenty-Third–and to thousands like them, in Kentucky, Tennessee, Missouri, Kansas, and the other outlying regions–it beat all hollow the usual operation of detached service in small groups. And, surprisingly perhaps, it was less dangerous. Few men died that day, whereas when the regiment was chasing guerrillas in small bands it suffered heavily. The casualty quota of the Twenty-Third was, if not high enough to rank it among the 20 or so Northern regiments suffering the highest rate of battlefield deaths, sufficiently high to place it on a select list of 300 fighting regiments. Out of the 2,230 who served in the Twenty-Third, 159 died of wounds and 131 from disease, for a total of 290. Most fell to guerrillas, others in the major actions of the regiment–Carnifex Ferry, Princeton, South Mountain, Antietam, Lynchburg, Berryville, the Opequon (or Winchester), Fisher’s Hill, and Cedar Creek. The war of the Twenty-Third Ohio was neither romantic nor glorious. But it was necessary. This regiment, and others like it, held areas Lincoln had to have if the North were to win the war. The role the Twenty-Third was called upon to play was important, and the men of Ohio carried it out with skill, valor, and pride. Outstanding men emerged from the regiment, and in later years they were always ready to recall their association with it. On the day he left Ohio, in 1877, to take up residence in the White House, Rutherford B. Hayes told his fellow citizens: ‘A little less than sixteen years ago I march . . . with one thousand men . . . to the South to do what we could to restore the Union of the States, and to reestablish the authority of the Constitution. In that work we were eminently successful . . .’ They were, indeed, more successful than perhaps even they suspected. This article was written by T. Harry Williams and Stephen E. Ambrose and originally published in the October 1997 issue of Civil War Times Magazine. 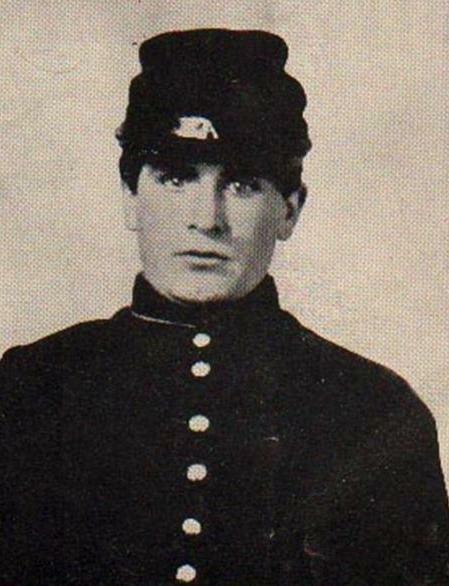 And of course here is a photo of young William McKinley at the time he was in the 23rd OVI.